Nestled in a mountain cove, our "Appletree", "Blueberry" and "Primrose" cottages offer more than the typical mountain "cabin". Each cottage can accommodate up to 6 people with two bedrooms, living room with fireplace, large kitchen/dining area, cable TV, washer and dryer and a screened porch with rocking chairs and a swing overlooking the Snowbird Mountain. "Primrose", our newest cottage, is wheelchair accessible. three bedrooms, two baths, wonderful view of Snowbird mountains. Perfect for larger families or small groups. $750.00 per week. Children are welcome in the cottages, and they will love the sparkling mountain stream, petting Smoky the cat and our two Great Pyreneen dogs (GiGi and Tigger), and visiting our four llamas. 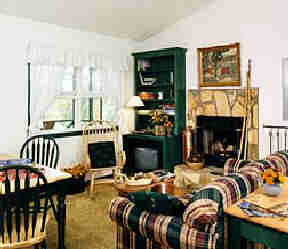 $125.00 per night for up to 6 people. Minimum stay 2 nights. Holiday weekends and October, 3 nights. Prices do not include 9% state sales and occupancy tax. Cottage check in time - 3pm to 8pm, check out 10 am. 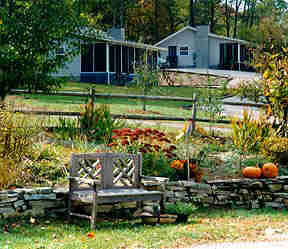 50% deposit required on cottages; refundable with 30 day cancellation notice.